Campbell was born in Ramelton, County Donegal, Ireland in 1930 , the third son of R. J. Campbell, a farm supplier. He studied at Trinity College, Dublin with James Desmond Smyth, graduating in 1952 with first class honours in Zoology. He then attended the University of Wisconsin–Madison on a Fulbright Scholarship, earning his PhD degree in 1957 for work on the liver fluke, a parasite affecting sheep. From 1957 to 1990 Campbell worked at Merck Institute for Therapeutic Research, and from 1984 to 1990 he was a Senior Scientist and Director with Assay Research and Development. He became a US citizen in 1964. One of his discoveries while at Merck was the fungicide thiabendazole, used to treat potato blight, historically a scourge of Ireland. Thiabendazole is also used to treat trichinosis in humans. Campbell is best known for his work on parasitic diseases. Japanese microbiologist Satoshi Ōmura isolated and cultured many varieties of natural soil-based bacteria from the group Streptomyces. Campbell lead a team at Merck in studying Ōmura's cultures and examining their effectiveness in treating parasites in domestic and farm animals. From the sample Streptomyces avermitilis, naturally produced in soil, he derived macrocylclic lactone. After further modification, it was named ivermectin (generic) or Mectizan. In 1978, having identified a successful treatment for a type of worms affecting horses, Campbell realised that similar treatments might be useful against related types of worms that affect humans. In 1981, Merck carried out successful Phase 1 treatment trials in Senegal and France on river blindness. Taken orally, the drug paralyses and sterilises the parasitic worm that causes the illness. Merck went on to study the treatment of elephantiasis. The research of Satoshi Ōmura, William Campbell, and their co-workers created a new class of drugs for the treatment of parasites. In 1987, Merck decided to donate Mectizan to developing countries. Campbell was instrumental in that decision. With the World Health Organization they created an "unprecedented" drug donation program, with the intention of wiping out the disease. As of 2001[update] an estimated 25 million people were being treated each year, in a total of 33 countries in sub-Saharan Africa, Latin America, and the Middle East. As of 2013[update], the Carter Center independently verified that the disease had been eradicated in Colombia, Ecuador, and Mexico. The greatest challenge for science is to think globally, think simply and act accordingly. It would be disastrous to neglect the diseases of the developing world. One part of the world affects another part. We have a moral obligation to look after each other, but we're also naturally obligated to look after our own needs. It has to be both. From 1990 to 2010, when he retired, Campbell was a research fellow at Drew University in Madison, N.J., where he supervised undergraduate research and taught courses in parasitology. He has written about the history of parasitology in Antarctic exploration, including the work of surgeon Edward L. Atkinson in Scott's ill-fated Terra Nova Expedition. In 2002, Campbell was elected member of the United States National Academy of Sciences. In 2015, he and Satoshi Ōmura shared half of the 2015 Nobel Prize in Physiology or Medicine for their research on therapies against infections caused by roundworm parasites, using derivatives of avermectin. (The other half went to Tu Youyou for work on malaria treatments.) Campbell is the seventh Irish person to be awarded a Nobel Prize, including Ernest Walton was awarded the Nobel Prize in Physics in 1951 and Samuel Beckett for Literature in 1968. William C. Campbell is married to Mary Mastin Campbell. He is a published poet and painter. His recreational activities include table tennis and kayaking. ^ a b "Prof. William Campbell, of NJ, wins Nobel Prize in medicine". News 12 New Jersey. Associated Press. 5 October 2015. Retrieved 6 October 2015. ^ "William C Campbell, Satoshi Ōmura and Youyou Tu win Nobel prize in medicine". The Guardian. 5 October 2015. Retrieved 5 October 2015. ^ a b c d e "The 2015 Nobel Prize in Physiology or Medicine – Press Release: William C. Campbell, Satoshi Ōmura, Youyou Tu". Nobel Foundation. Retrieved 8 December 2015. ^ Molin, Anna (5 October 2015). "Nobel Prize in Physiology or Medicine Awarded to William C. Campbell, Satoshi Omura, Youyou Tu". The Wall Street Journal. Retrieved 5 October 2015. ^ a b c Scott, Dermot. "William C. Campbell (Sc.D.)". Ramelton Tidy Towns. Retrieved 9 December 2015. ^ "William C. Campbell – Facts". Nobel Prize. Retrieved 24 September 2016. ^ a b c d Murphy, Darragh (9 October 2015). "Meet Ireland's new Nobel Laureate, William C Campbell". The Irish Times. Retrieved 13 October 2015. ^ a b c d e f g Overstreet, Robin M. (2008). "Presentation of the 2008 ASP Distinguished Service Award to William C. Campbell". Faculty Publications from the Harold W. Manter Laboratory of Parasitology. Retrieved 9 December 2015. ^ Annual Report on Research and Technical Work of the Department of Agriculture for Northern Ireland. Great Britain: The Department of Agriculture for Northern Ireland. 1975. p. 149. ^ Jelliffe, E. F. Patrice; Jelliffe, Derrick B. (1982). Adverse Effects of Foods. Boston, MA: Springer US. p. 277. ISBN 9781461333616. Retrieved 9 December 2015. ^ "History". Merck & Co., Inc.
^ a b c d Avril, Tom (6 October 2015). "Former Merck scientist shares Nobel in medicine". Philadelphia Inquirer. Retrieved 8 December 2015. ^ a b c "Merck Offers Free Distribution of New River Blindness Drug". The New York Times. 22 October 1987. Retrieved 8 December 2015. ^ Siddall, Mark (13 October 2015). 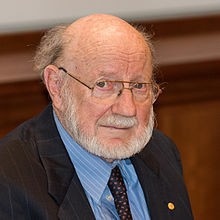 "A Noble and Laudable Nobel Laureate: William C. Campbell". HuffPost. Retrieved 9 December 2015. ^ Sturchio, Jeffrey L (2001). "The Case of Ivermectin: Lessons and Implications for Improving Access to Care and Treatment in Developing Countries". Community Eye Health. 14 (38): 22–23. PMC 1705916. PMID 17491909. ^ "African Programme for Onchocerciasis Control (APOC)". World Health Organization. Retrieved 8 December 2015. ^ "MORE THAN 25 Years: The MECTIZAN® Donation Program". Merck Be Well. Retrieved 8 December 2015. ^ Damico, Kathleen (29 October 2015). "Nobel Laureate Dr. William C. Campbell: A man of character, passion and art". PRWeb. Retrieved 9 December 2015. ^ Campbell, William C.; Overstreet, Robin M. (1994). "Historical Basis of Binomials Assigned to Helminths Collected on Scott's Last Antarctic Expedition" (PDF). Journal of the Helminthological Society of Washington. 61 (1): 1–11. Retrieved 9 December 2015. ^ "Member Directory | William Campbell". National Academy of Sciences. Retrieved 5 October 2015. ^ "Irish scientist wins Nobel Prize for Medicine". RTÉ News. 5 October 2015. Retrieved 5 October 2015. ^ "Samuel Beckett - Facts". www.nobelprize.org. Retrieved 2018-04-03. ^ "Dr. William Campbell: Nobel Laureate, Painter, Actor, Writer". Drew University. This page is based on the Wikipedia article William C. Campbell (scientist); it is used under the Creative Commons Attribution-ShareAlike 3.0 Unported License (CC-BY-SA). You may redistribute it, verbatim or modified, providing that you comply with the terms of the CC-BY-SA.